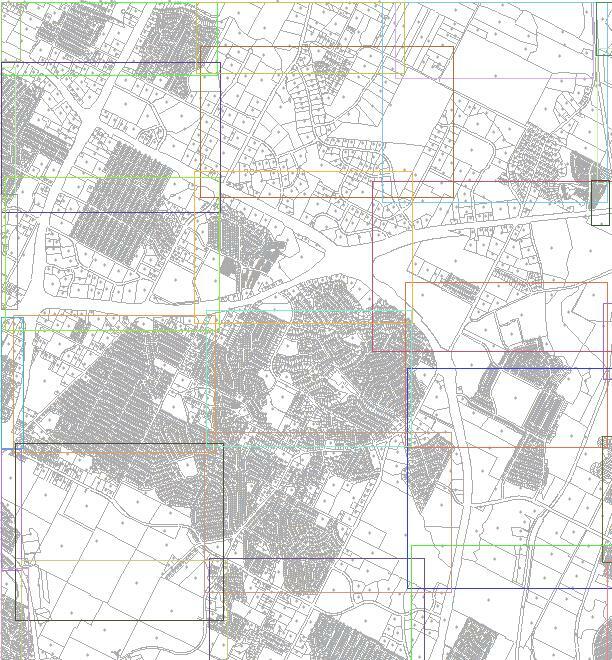 We have a set of AutoCAD DWG files that we want included in a metadata catalog provided by a deegree CSW server. A third-party editor was used to prepare an ISO19115 metadata file that contains most of the metadata records that are not file-specific, but we need to 'fill-in' several file-specific records, such as the geographic extent, file location, etc. The deegree documentation is comprehensive, and provides a good set of instructions for setting up the service. To verify that deegree is properly configured, navigate to the deegree web application running within Tomcat. The default url is http://localhost:8080/deegree-csw/ (or http://<host>:<port>/deegree-csw/). Links to capabilities, status information, and a basic client app are provided. The generic web service client provides a simple interface for sending XML-formatted requests to the service, and examining the XML-formatted responses. 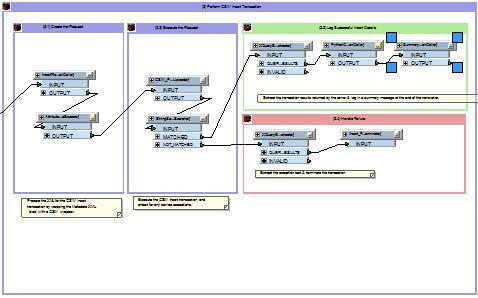 The client interface also includes several example requests, which are useful for understanding how CSW works. The 'template' metadata file included with this demo is derived from these examples. 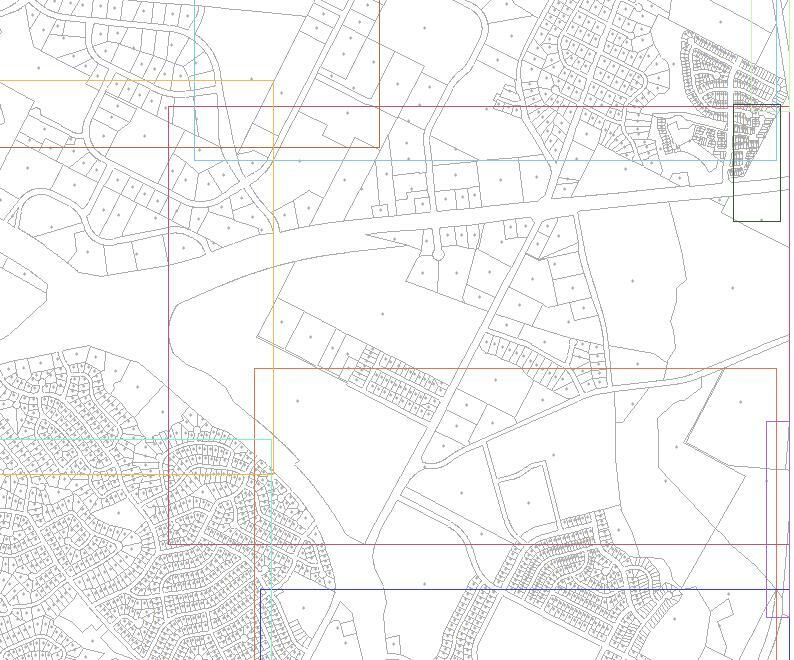 The source data is a set of AutoCAD DWG files consisting of parcel data for the city of Austin that has been divided into sections, some of which overlap. 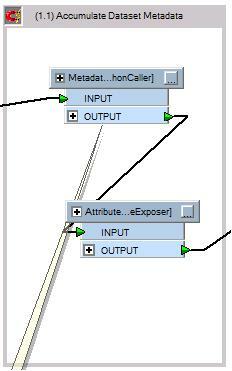 An overview of the data is show below; the bounding box of each file is shown as a colored box. A zoomed in section of above. 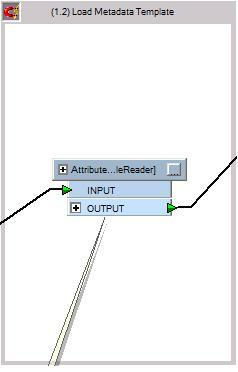 Typical FME translations read data from a file, which results in the creation of features with attribute data corresponding to the file data. 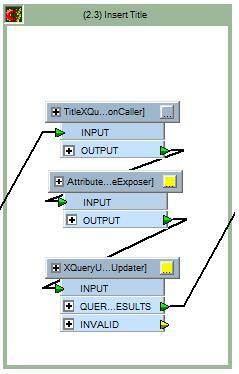 This workspace treats the XML metadata record as an opaque block that is manipulated using our XQuery transformers. An additional benefit of using XQuery is that it ensures that we are dealing with valid XML at every stage of the transformation, thus eliminating one potential source of service errors. For ease of navigation, the workspace has been divided into several numbered bookmarks. The following sections describe what is happening inside each of the bookmarks. This workspace reads from several AutoCAD DWG files. 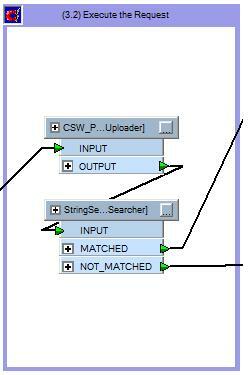 Normally, each file would map to an individual FME feature type, however, if you examine the properties for single source feature type, you will notice that it is a 'wild card' feature type that merges all source feature types. 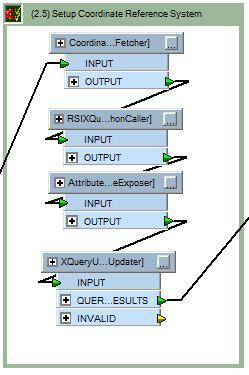 This is a very handy way of handling multiple files that share a common schema. In addition, a title (for the metadata citation) is generated based on the feature type. 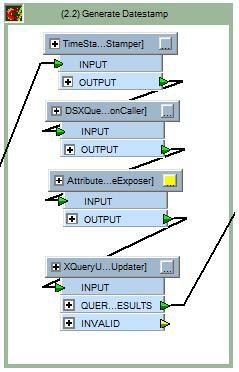 The transformer outputs one feature for every file that was read. A copy of the metadata template is added (as a string attribute) to each of the features as it passes through. 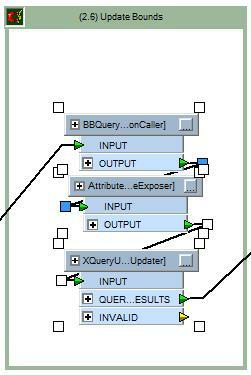 The other choice would be to use a Concatenator transformer but it would be harder to read the XQuery that is being created. For the purposes of this demo, each of these bookmarked blocks has been left 'exposed' in the main workspace window for illustration purposes. Encapsulation of these blocks into custom transformers is very easy, and highly recommended. Doing so will allow users to create a library of metadata manipulation transformers that can be easily chained together to manipulate a metadata record. 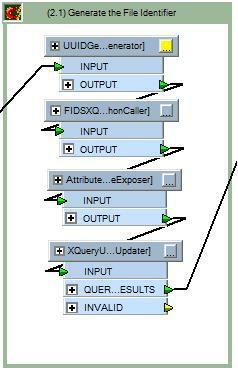 This block generates a fileIndentification section for the metadata. This particular demo uses random UUID identifiers generated by the UUIDGenerator(LINK_TODO) transformer; this approach may or may not be appropriate in a production environment if record updates are desirable. In such a situation, the identifiers would have to be obtained from an externally maintained mapping of filenames to identifiers. This block generates the dateStamp section. This block inserts the title element of the citation section. Generates the distributionInfo section that includes a transferOptions element for each dataset file that includes the file location and size. 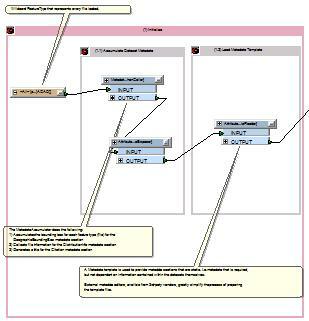 In this example, our source dataset is Autodesk DWG, which has one file per dataset. Other formats, such as MIF/MID or Shape have multiple files per dataset. See the MetadataAccumulator source code for an example of how multiple files can be properly handled. At this time, the format being worked with must be hardcoded into the MetadataAccumulator to correctly deal with this multiple file per dataset issue. Depending on organizational requirements, there may be other options for indicating file location and format; this is only one example. The RS_Identifier element can contain two elements: code and authority. 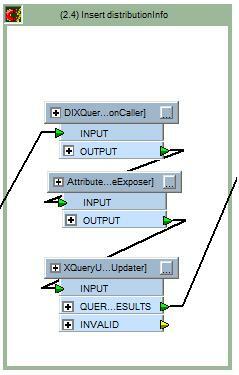 This example places the FME CRS name in the code element. Individual metadata implementations may have differing requirements. 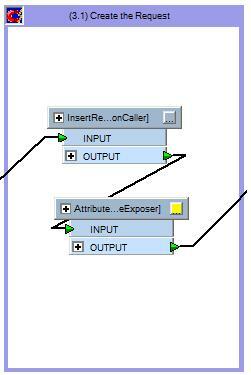 For example, EPSG numbers could be obtained from the FME CRS using the CoordinateSystemDescriptionConverter(Article#000001660) transformer and inserted here instead. Constructs the EX_GeographicBoundingBox element of the identificationInfo section using the bounding box that was accumulated earlier. Preparing a CSW Insert Transaction is fairly simple. The previously prepared metadata record is simply wrapped in a XML CSW transaction envelope. Using HTTP POST, the the request is posted to service provided by deegree. Note: depending on how your have installed & configured deegree-csw, you may need to change the URL of the service end-point in the HTTPUploader transformer. The server response is tested to see if it contains the text "Exception", which indicates that the transaction failed. The web-service will return a HTTP status of 200 regardless of if the insert succeeded or not. Rather that logging each result, the SummaryLog accumulates all results, and creates a concise summary log at the end of the translation. 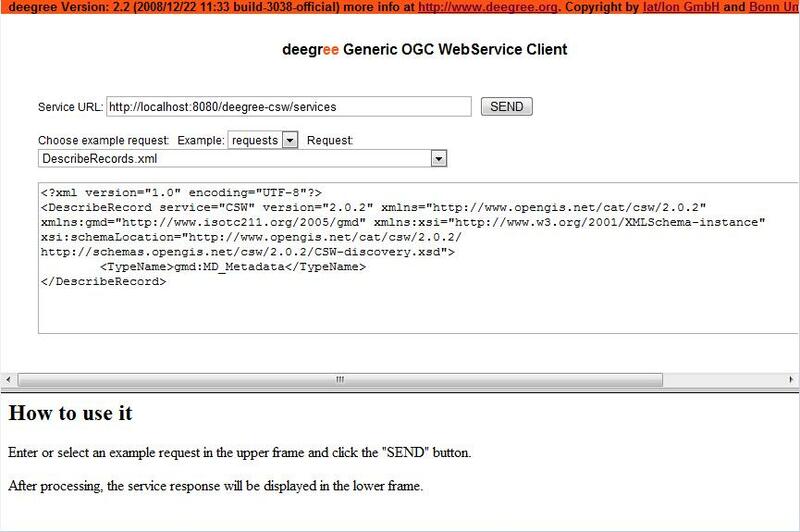 Upon failure, deegree-csw will respond with an exception message that describes what caused the failure. Assuming the service is properly configured, the most common failure causes are either malformed XML, or non-conformant metadata records.